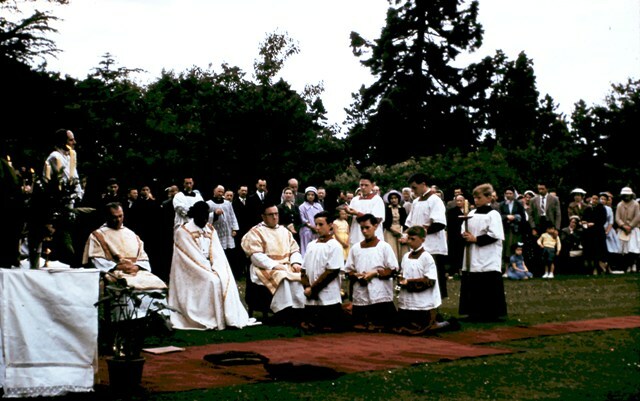 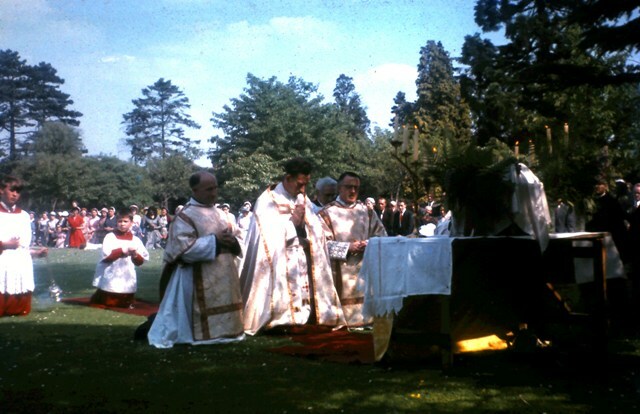 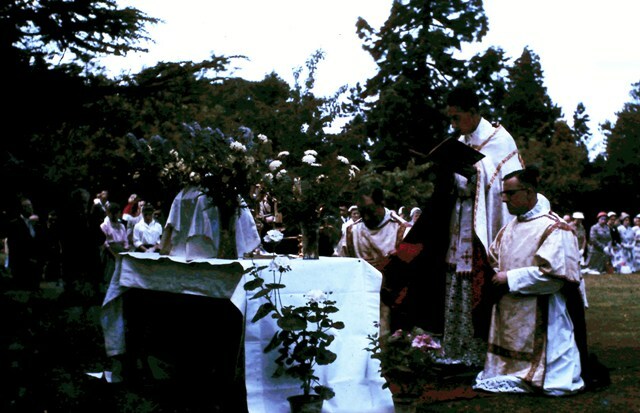 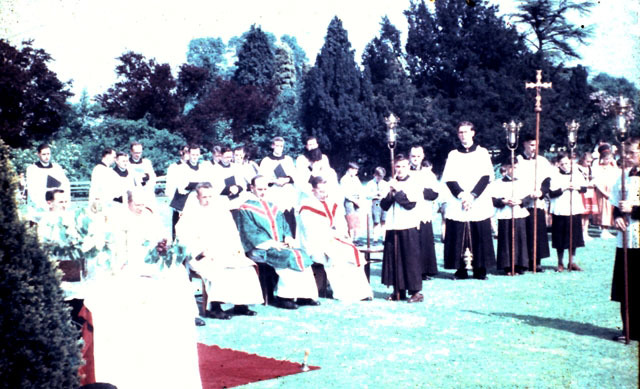 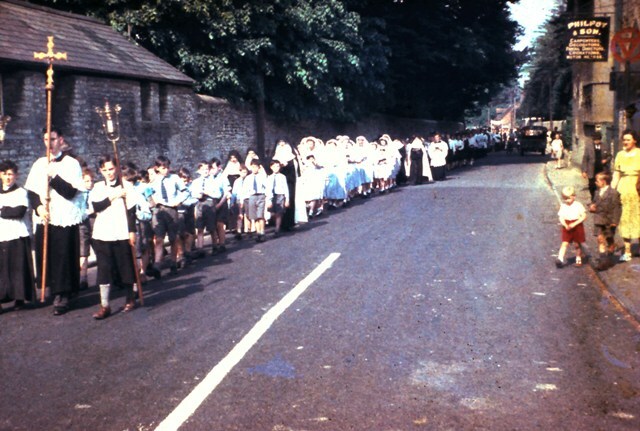 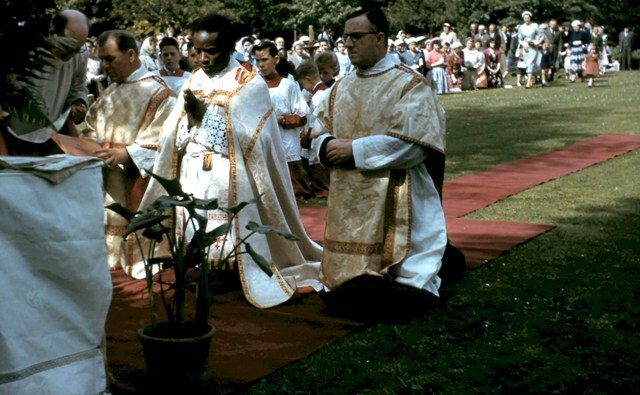 1950s or early 1960s Corpus Christi Processions. 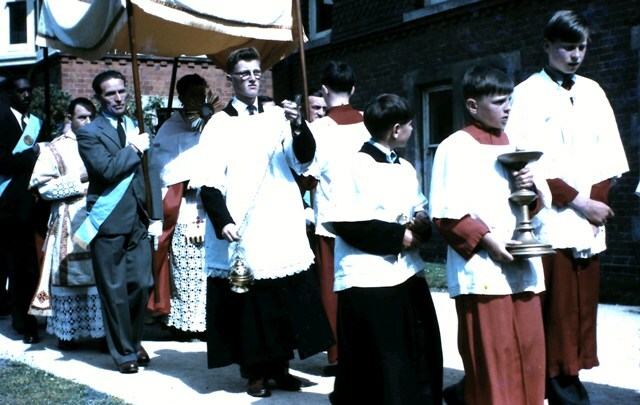 The annual Corpus Christi Procession was, and in many Catholic counties still is, an important part of the liturgical year. 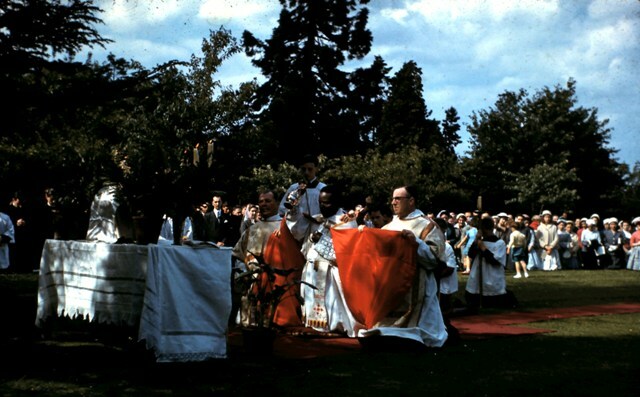 The Blessed Sacrament is placed in a monstrance and is taken in procesion to an open air altar where Benediction is celebrated and the gathered faithful are blessed by the officiating priest with the exposed Host. 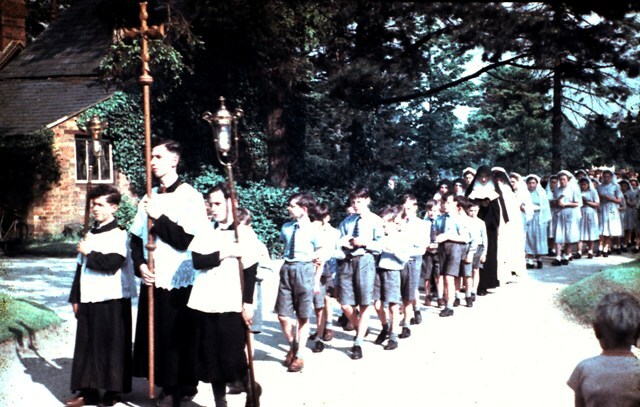 The Blessed Sacrament is then returned in solemn procession to the mother church. 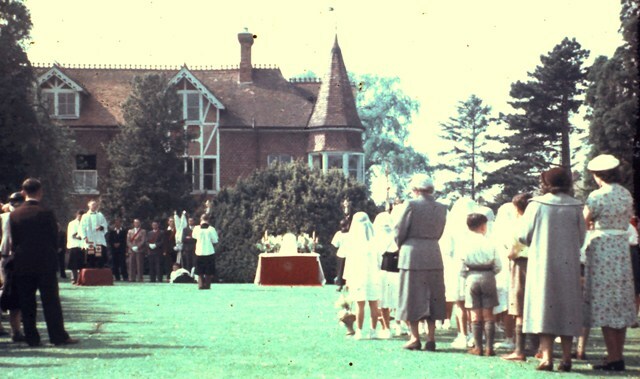 In the late 1950s or early 1960s the Cahtolics of Bicester and the surrounding area took part in this celebration. 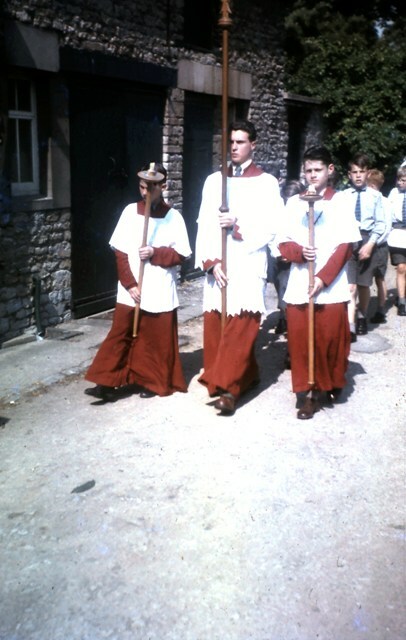 The procession would leave the old church in Priory Lane, proceed down Chapel Street (shown in the first picture), through the Market Square and go via Market Hill and the Launton Road to the Garth Park where Benediction would be celebrated. 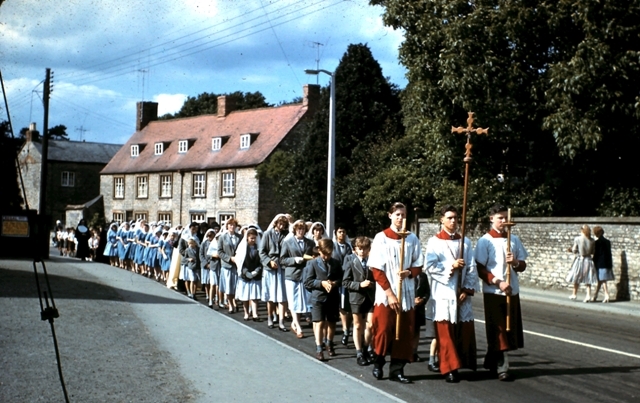 The procession would then return to the church via the London Road and Priory Road. 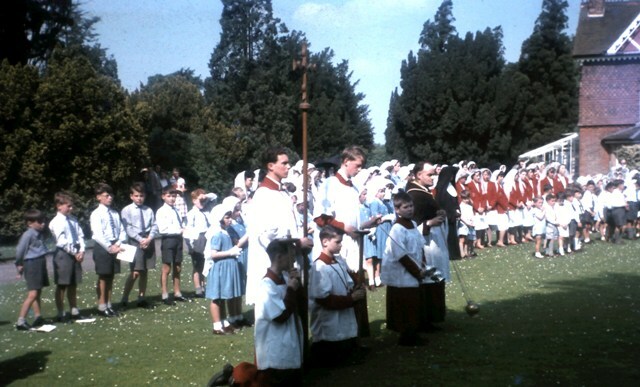 The procession would include chldren from local Catholic schools as well as reprasentatives from local religious communities. 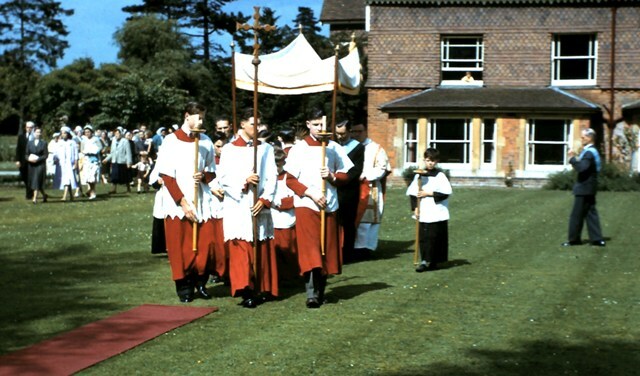 The processional cross and monstrance shown are still in the parish and the latter is still used on the Feast of Corpus Christi and other occasions. 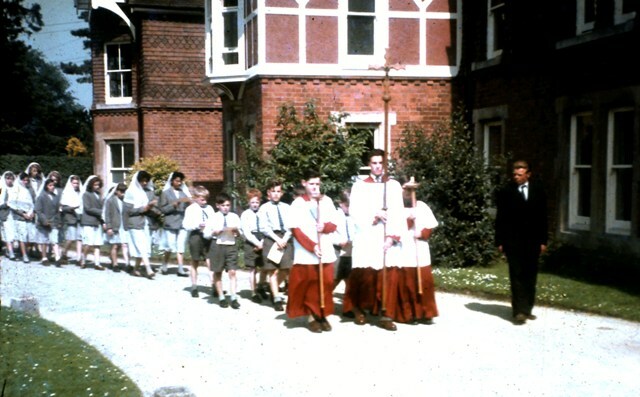 The processional cross now lives in graceful retirement in the sacristy. 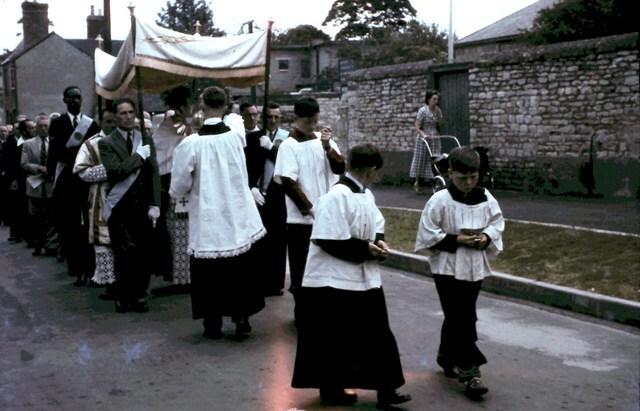 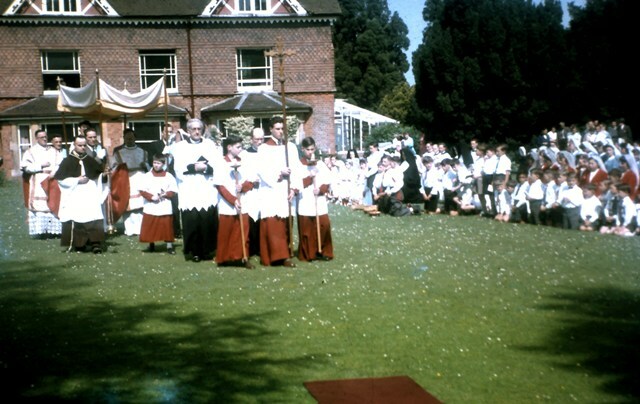 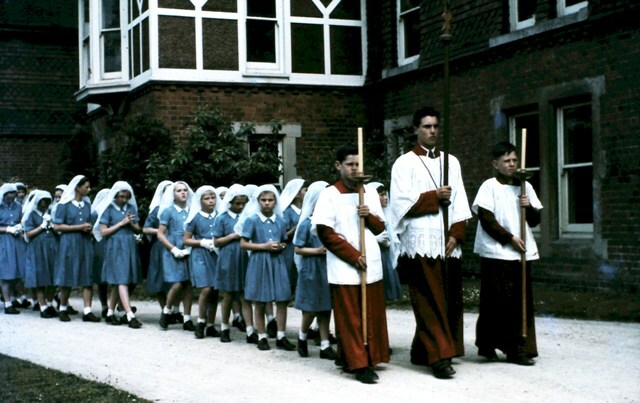 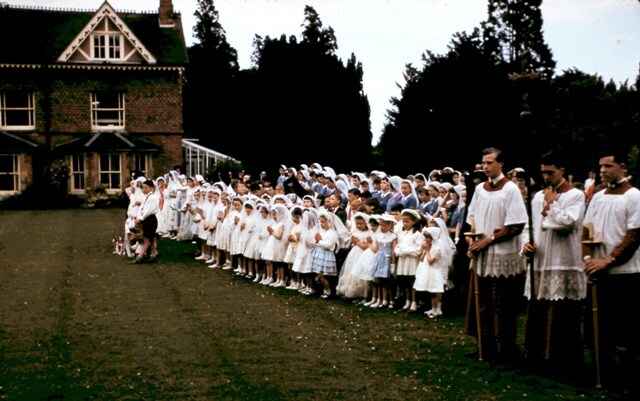 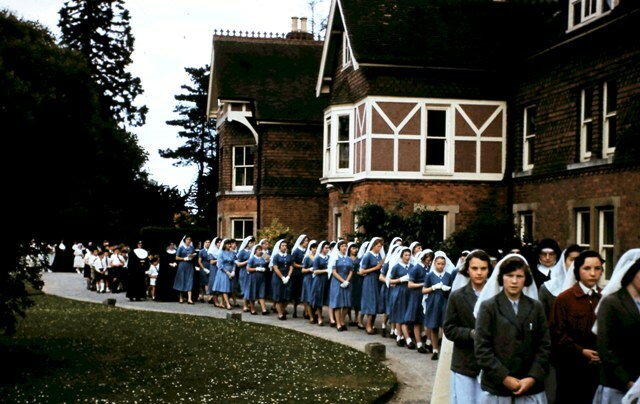 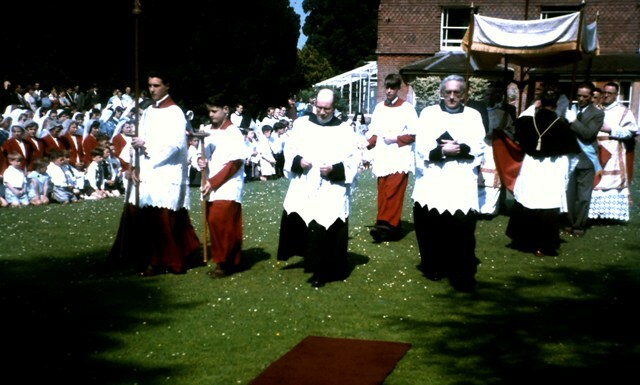 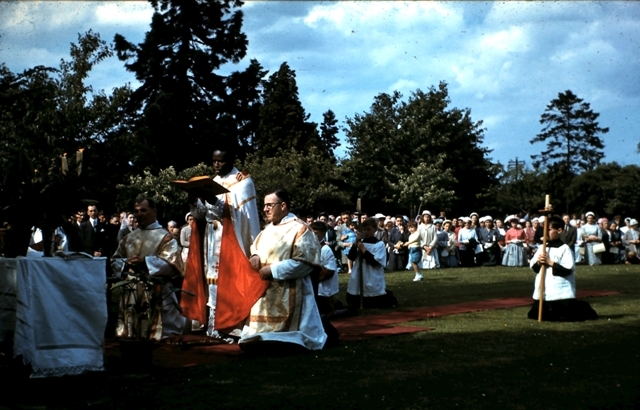 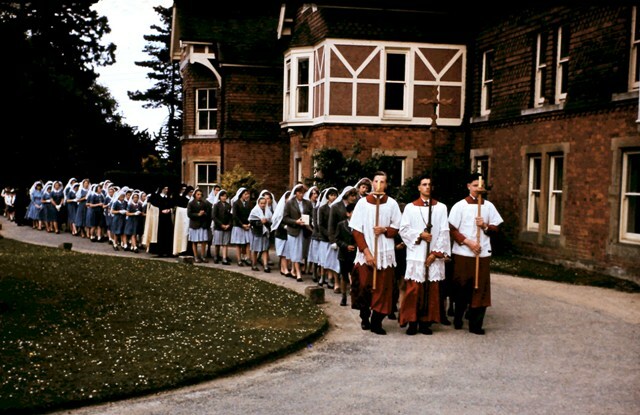 Existing in the parish archives is a set of slides of these processions. 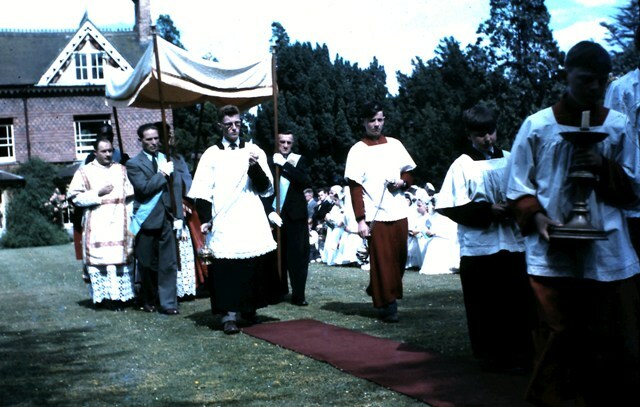 Although undated they appear to be a compilation of more than one procession and must pre-date 1963 when the new church was opened. 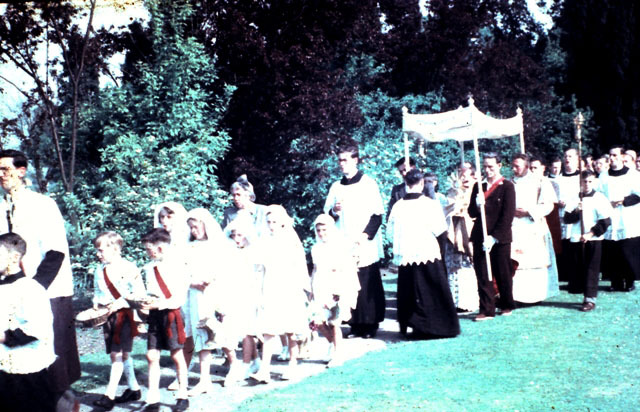 The fashions and film used would suggest the dating given above. 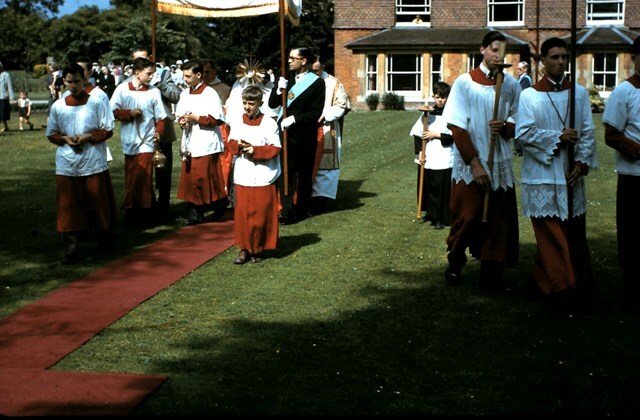 Sadly the years have been kinder to some of the slides than to others but after roughly fifty years, on the Solemnity of the Most Holy Body and Blood of Christ 2010, they deserve a wider audience and a selection of the best preserved are shown. 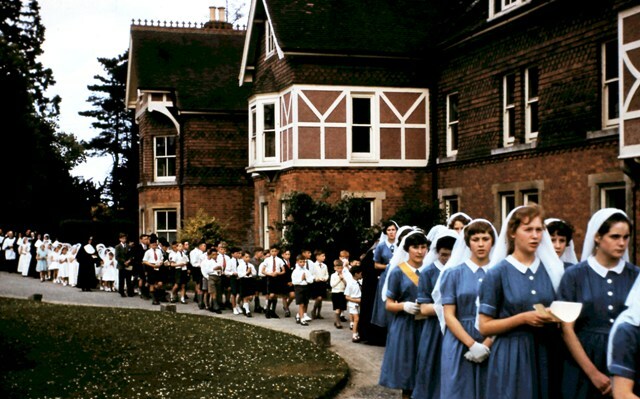 Unfortunately the identity of the photographer is not known but full acknowledgement is duly given.